If you do not have a 4G LTE data connection, you can use the Ellipsis help app. 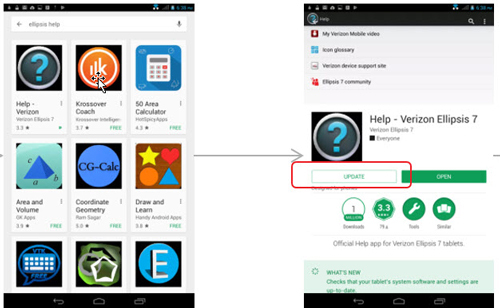 Check software verison by navigating: Apps > Settings > About Tablet. The most current software versions are MV7B_41D37_442 and MV7A_41D37_442A. Repeat steps as needed until your device is on the most current software version. If the update is not successful, use the Ellipsis help app. Connecting to Wi-Fi is recommended. 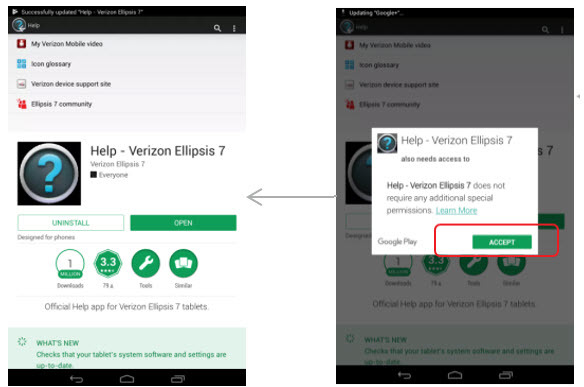 Search the Play Store for 'Ellipsis Help' then tap UPDATE. If you see 'Uninstall' instead of 'Update', the app is up to date. Tap OPEN to download the app then tap ACCEPT. Wait for 1 minute for the system update notification. Tap Power Cycle Now then wait for update to be completed. This may take up to 5 minutes.